We pay special attention to respecting the privacy of users visiting our website. The data collected in the logs is used only for administration purposes. No identifying information is transferred to any third party for any purpose. According to the accepted practice of most websites, we store HTTP queries directed to our server. These data are not associated with specific people browsing amddentech.com.pl. To ensure the highest quality of the website, we occasionally analyze log files to determine which pages are visited most frequently, which web browsers are used, whether the page structure is free of errors, whether the page displays correctly with different settings, etc. The collected logs are stored for an indefinite period of time as an auxiliary material used to administer the website. The information contained therein is not disclosed to anyone except persons authorized to administer the server and the website www.amddentech.com.pl. Logs can be generated on the basis of log files to assist in administration. Collective summaries in the form of such statistics do not contain any features that identify visitors to the site. The Cookies mechanism is not used to obtain any information about users of the website or to track their navigation. Cookies used on the amddentech.com.pl website do not store any personal data or other information collected from users. The website may periodically use the session cookie file called INFO to record the fact of reading the highlighted information. A cookie is created in order to limit the number of emissions of periodically appearing advertisements. Thanks to the use of the Cookie file, the information is displayed only once for one user session and does not appear again after switching to the next page of the website. The session cookie peak mentioned above, if it is created, occurs at a specific time, it is only for the time the site is visited by the user. 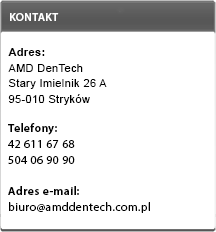 Closing the browser window from the website www.amddentech.com.pl deletes the created file.